LE CASTELLET, France (AP) Lewis Hamilton finally got his improved engine and put it to good use on Saturday, streaking away to a record-extending 75th career pole position at Formula One’s French Grand Prix. 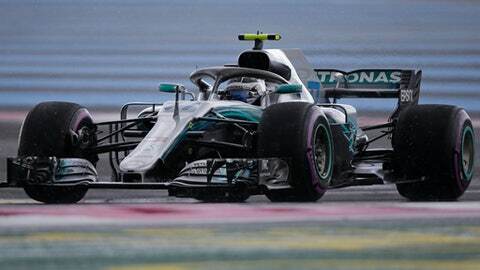 Hamilton’s main challenger for the fastest time at the Paul Ricard Circuit was teammate Valtteri Bottas, who was the second quickest ahead of points leader Sebastian Vettel in his Ferrari. The Mercedes pair is poised for another one-two victory it achieved after starting from the front row in Barcelona last month. Hamilton lost his lead in the standings to Vettel two weeks ago when Mercedes couldn’t deliver a planned engine upgrade on time. He finished the race in Canada fifth, and saw Vettel turn a 14-point deficit into a one-point lead with a victory. The British driver has put himself into position to boost his title defense if he can continue the dominant driving he has shown in the past two days at the track just inland from the Cote d’Azur. Bottas credited the upgrade with the gains on the track. In F1’s first race in France in a decade, Hamilton quickly adapted to the unfamiliar track by posting the top times in both of Friday’s qualifying sessions, while Vettel struggled to find the right driving lines. Red Bull pair Max Verstappen and Daniel Ricciardo posted the fourth- and fifth-fastest times in qualifying. They were followed by Ferrari’s Kimi Raikkonen, Renault’s Carlos Sainz Jr. and Sauber rookie Charles Leclerc, who impressed with his first top-10 time. Heavy rain kept cars mostly in their garages during Saturday’s final practice, when Bottas topped the timesheet. The track mostly dried out in time for qualifying, but a light drizzle returned midway through the hour-long session. The return of the French GP after a decade-long absence is the first part of an unprecedented tripleheader of three races on consecutive weekends with the Austria and British events coming in quick succession. The last time Le Castellet held an F1 race was in 1990 when French great Alain Prost won for Ferrari.